Saving You from the Hassles of Paper Shredding, Shred Connect has shredding services at locations conveniently located in Garden Grove and other surrounding Orange County communities. Shred Connect is ready to provide area residents and businesses with shredding services that meet all of their document destruction needs. Whether you’re an individual with some credit card offers that you don’t want to just throw out, a small business needing to dispose of some client information, or a large business that has to dispose of rooms full of documents that have been accumulating for decades, Shred Connect is ready to provide you the secure document shredding solutions you need. You can choose to come in to our storefront or have us come to you with one of our mobile shredding units . Are shredding services really so important that a business can be built around it? The answer is a resounding “Yes!” The main reason is that identity theft has never been easier, and throwing out a piece of paper with credit card information, a birth date, Social Security numbers, or other sensitive information could be the start of your worst nightmare. A savvy thief rifling through garbage and coming across such information could start with a simple name and birthdate to begin emptying out existing accounts, or even opening up new ones in the victim’s name. Within just days, life savings could be lost and someone who spent years building up a solid credit rating could find himself unable to get a mortgage, buy a car, or even get a credit card, with all of the damage being done before he even realizes that anything is wrong. Preventing this kind of thing from happening to you requires caution in what information you store on computers, but also care in making sure that documents containing sensitive information can’t fall into the hands of those who would misuse it. This is why Shred Connect provides confidential paper shredding services. Beyond the most obvious need for shredding services, identity theft, individuals should also want to employ Shred Connect to protect their privacy. Nosy neighbors, family members, and friends could all gain access to things that you don’t want them to know. Even something that gets thrown in the garbage could potentially be seen by city employees or anyone who decides to look through your trash. Revealing written correspondence, copies of bills or statements, old medical records, even things like prescriptions for medication may be perfectly legal but also potentially embarrassing. Using our secure document shredding services to dispose of these types of documents allows you to rest assured knowing that nobody will ever see this information. Businesses have similar reasons to use our document shredding services. They are entrusted with valuable information by partners, vendors, and clients, and it is imperative that they treat this information with the utmost care and respect. Legal issues can quickly arise if businesses allow the personal information of those with whom they have relationships to be compromised. Beyond that, though, there’s also just a basic trust issue. If you’re a business owner, you want the people you do business with to know that they can trust you. Providing them proof that you have destroyed their sensitive information by means of a Certificate of Destruction is a great way to build that trust and show people that you take their privacy seriously. The added concern for businesses is protecting proprietary information. Internal memos, order forms, contracts, and other information regarding strategy and operations need to be kept confidential. Competition is fierce, and many businesses will do anything to gain an advantage. That could include accessing another company’s confidential information by going through trash, or even by attempting to pay an employee to share such information. Most businesses will make use of paper documents, but that doesn’t mean that they should leave them lying around the office well beyond their usefulness. Destroying these documents is an excellent way to make sure that other businesses and members of the public don’t gain access to such information. Shred Connect has two primary shredding services; by Drop-off or mobile shredding. 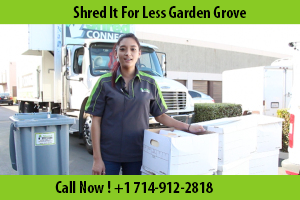 To meet the needs of those in Garden Grove, Shred Connect offers two different ways for individuals to make use of our shredding services. The first is by providing a conveniently located document destruction drop-off center. This is a great option for those who have monthly bills, a few contracts, or other small amounts of documents that they want to ensure do not fall into the wrong hands. Simply bring your documents in and lock your documents in a triple security shredding container and we will come by later on to complete the necessary shredding services. After all of your documents have been destroyed we send you a Certificate of Destruction so you can rest assured that no one will ever be able to read your confidential information. Businesses or local residents that require large scale shredding services may prefer our mobile shredding option. Call us to schedule an appointment and we’ll send one of our mobile shredding trucks to your home or place of business. This will save you or your employees the time they would otherwise spend shredding documents by hand. 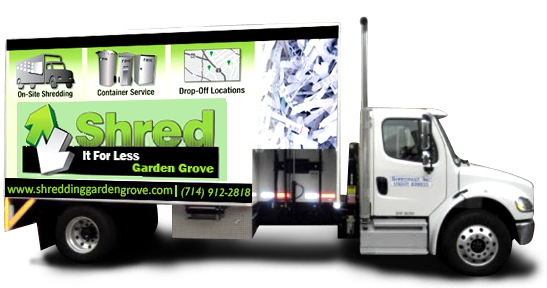 If you live in Garden Grove, let Shred Connect meet your document destruction needs. 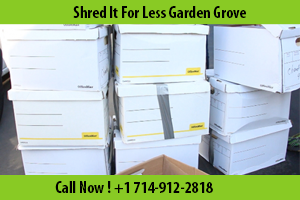 Call Shred Connect today for convenient Shredding Services in Garden Grove.